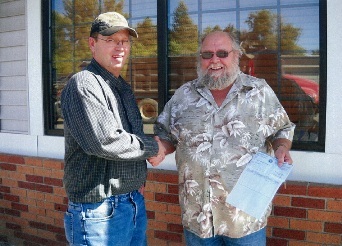 IAM Local Lodge 509 member Corey Martin, right, receives disaster relief check from Local Chairman Gary Whitmer. Martin, of Minot, ND, suffered extensive loss from the record-setting flooding earlier this summer. This year has been particularly harsh when it comes to natural disasters. All across North America, people have been hit with tornadoes, hurricanes, wild fires, massive flooding, severe drought and/or earthquakes. Some IAM members have been the unfortunate victims of these disasters; some losing everything they had. And that’s where our IAM Community Services Department comes in. So far this year, the Department has distributed disaster relief funds to 33 IAM members. If you have any questions or need more information, contact the Community Services Department at 301-967-3433.